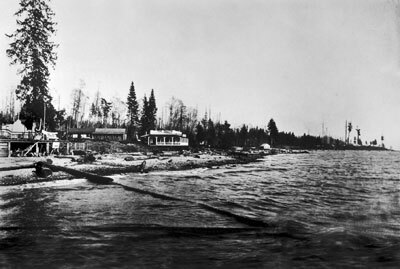 View looking East down a West Vancouver beach. Houses can be seen along the the waterfront. Scanned July 2013 using Epson Perfection V700 Photo at 600dpi and 100% of original negative transparency size. Alternate Versions: Lossless TIF from original scan at 600dpi and 100% of original slide. W9.5 x H7cm (3.5x2.5") black & white negative transparency.